- Other groups of products. This is a brand new line of products that Mont Bleu makes. There are simple and luxury crystal jewelry presented here. 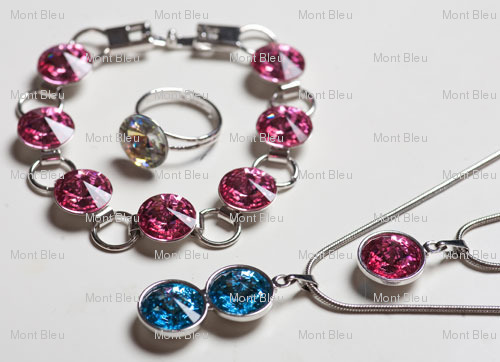 Mont Bleu keeps Bohemian tradition in making jewelry, hair accessories or crystal nail files. Our main office is located in Prague, Czech Republic, in the heart of the historic Bohemia region. We use high metal covered with rhodium, silver and wood as base in our Bohemian jewelry, then we decorate them with crystals from SWAROVSKI® ELEMENTS. Bracelets – metal bracelets covered with rhodium (which is anti-allergic), and Swarovski crystals. Mont Bleu hand work, personal touch with precise position and top quality. Crystal Earrings – metal earrings covered with rhodium and Swarovski crystals, lots of colors and shapes. Unique wood earrings with lots of shiny crystals | hand made by Mont Bleu. Rings – simple metal crystal rings, fashion “Bouquet” rings, luxury “Design” rings, wood rings, there is plenty to choose from when we talk about Mont Bleu rings. We use only quality materials, including Swarovski crystals, when we make our fabulous rings. Each item is hand made with care by Mont Bleu in Prague. Pendants – simple metal pendants with one Swarovski crystal either on metal chain, or pendants that consist of superior Swarovski crystals and leatherette band. Wood pendants covered with crystals are also presented here, but they do not include a band in the set. Wood Brooches – hand crafted unique designed wood brooches hand decorated with Swarovski crystals, variety of popular colors makes these brooches a certain choose as gift. Jewelry Sets can be made by combining matching pendant, ring, bracelet and earrings. Hair Barrettes – made of wood, jeweled with wonderful Swarovski crystals that shine in hundreds of edges. 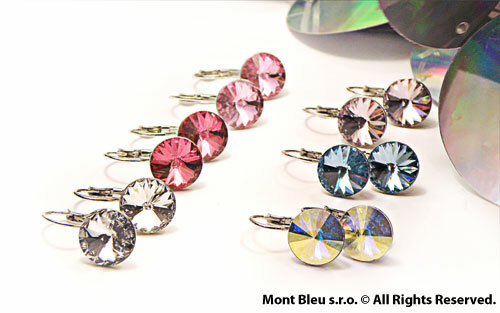 Hair barrettes from Mont Bleu are ultimate glamour hair accessory. 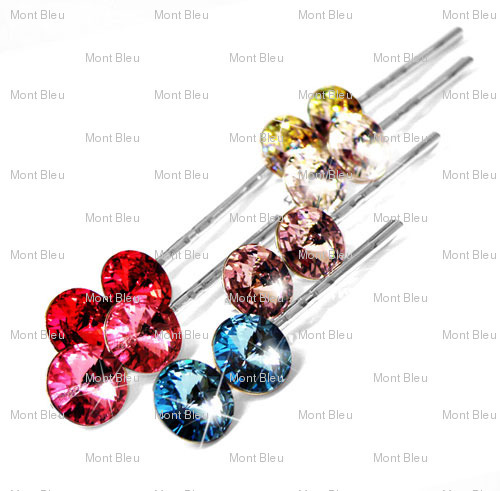 Hair pins – metal covered with rhodium, Swarovski crystal, a very simple combination, but when you make an effort such a simple piece can be transformed in jewelry. Both hair pins and barrettes are part of hair accessories group on our website. Buy one of our crystal jewelry on our official e-shop, to send wholesale inquiry, please contact us. • Other groups of products. 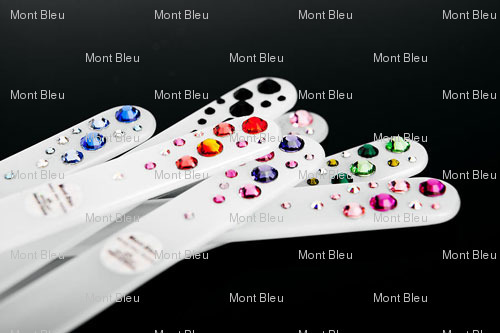 If you are looking for perfect nail care tool, check our Color glass nail files or Swarovski crystal nail files. 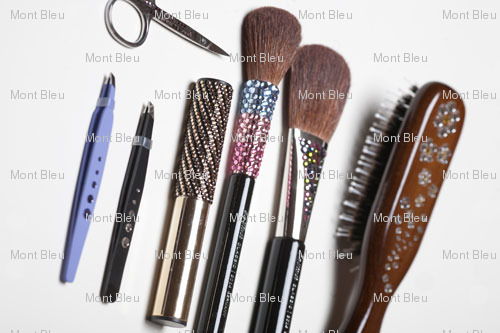 Mont Bleu can offer plenty of other hand decorated items; check them in Luxury gifts and Luxury beauty tools.